By far, the most resistance I face when teaching students in my course, or in my consulting work, is with finding and narrowing down to a web design niche for their business. I know, I know, I’ve heard it all. And yet, once I get my students to niche, they get MORE web design clients than they did previously. It’s the most counter-intuitive thing, and yet that’s exactly how it works. So why does choosing a web design niche actually result in MORE clients? To understand, first let’s break down what a niche really is. What is a web design niche? If you’ve been around the internet entrepreneur world for a hot second, you probably know what a niche is. But everyone’s got a slightly different way of defining it, so let’s pause for a second and I’ll explain how I define a niche. A niche is a group of people with the same problem. That’s right, we’re not talking about a cute little cubby in your wall that you can decorate or stick things in, we’re talking about a select group of people–and here’s the important part: with the same problem. We’ll get more into that in a minute. How do you find your web design niche? The easiest way to start narrowing down to a web design niche is by choosing an industry. Why? Because that immediately eliminates all other industries. And in the web design world, that’s especially important, because different industries need entirely different websites. For example, a nutritionist who sells one-on-one consulting and custom meal plans is going to need an entirely different type of website than an artist who paints and sells her work. And both of those people are going to need an entirely different website than a boutique hotel, that needs to take online reservations. So choosing an industry is the fastest way to start narrowing down to a select group of people who share a problem. It’s not the only way, but it’s the one I recommend starting with, because it’s the easiest. But if you’re really opposed to serving just one industry, you can niche based on the problem. For example, instead of niching down to nutritionists who sell one-on-one consulting, you can niche to a wider variety of consultants; nutritionists, marketers, etc. However, this is much harder to market, and get known for, so I don’t recommend it to anyone who is still struggling to get clients, and instead only recommend it to established web designers with consistent sales who are looking to branch out of an industry they’ve served for years–typically because they’re bored. But whatever you choose, choose a niche that you’re interested in and passionate about. This will help hold your interest, get you excited to learn more about the niche and the problems your niche faces, and will help you provide better service to your clients. Why niche your web design business? Alright, this is all well and good, but really, WHY do you need to niche? Why turn customers away? Why limit your creativity with only certain types of sites? Why get stuck doing the same thing over and over? Because niching will bring you more business. When you only serve a specific group of people who have the same problem, then you turn away those who don’t fit the mold. And this is a great thing. Because as you work with a specific niche and help them, you’ll become known in that niche as a web designer who “gets” them. They’ll understand what you do and who you help, so they’ll want to hire you. You’ll be far more appealing as a web designer who helps nutritionists book more consultations than a web designer who makes websites for everyone. Niching will also help people understand what you do and who you do it for, so referrals will be easier. When a friend meets a nutritionist who is struggling to book clients regularly, she’ll know exactly who to send to her to. When you niche, you become an expert. You’re able to understand the ins and outs of the industry and the people within your niche. You become someone people WANT to work with, and will actually pay more to work with than they will a generic web designer, because YOU understand their problems and can offer them a solution. Not just a website. This means you’re no longer competing with other generic web designers, you become THE designer to work with. When you niche you streamline your offerings. Remember when we talked about different industries needing different types of websites? The problem when you’re serving so many industries is that you can’t be an expert in them all. That means you not only don’t fully understand the client’s problem, but every client requires a different type of website that you may not know how to create properly. So one week you’re doing a simple brochure site, and the next you’re wading through creating a membership. When you work that way, it’s impossible to create clear systems, processes, and timelines, because every project is a new experience. Which means what? Unhappy clients. But when you niche, you not only understand your clients’ problems, but you understand exactly the type of website they need. And since you work within the same niche, all the websites end up being technically very similar–as in, the tech is similar. You’re not starting from scratch each time. That means, you can focus more on the design and strategy of the website, instead of hours Googling how to set up worldwide shipping. You’re able to calculate how long a project should take, and create clear systems and processes to keep it on track. Not only does this cut down on the time you have to spend learning new tech each time, you’re able to offer your clients clear packages that meet their needs. Which means they’re ready to buy before you even send a proposal, because you’ve already got their solution outlined on your website. We’ve already touched on this, but if you’re struggling to get clients, niching makes it so much easier because people understand what you do, who you do it for, and how it helps them. When visitors land on your website you’re able to clearly state how you solve their problems. When someone in your niche is looking for a web designer, they’re able to clearly see that you’re the right person to hire. When you’re introducing yourself, writing your website copy, or just talking about what you do, you’re able to make a connection that you simple can NOT make if you’re a generalist. Niching allows you to connect with an audience in a way that is otherwise impossible. Niching is vital to creating connection, attracting more clients, and selling more services. 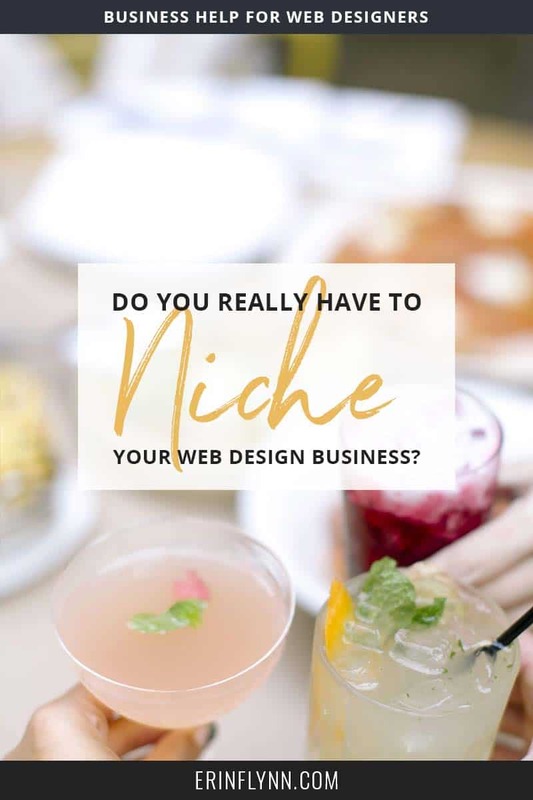 Yes, you need to niche your web design business. Niching will get you more clients, and make your life as a freelance web designer much easier!